Like it or not, the crisp chill in the air only means that snowy weather will be here sooner rather than later. While very little will likely end up on our streets and sidewalks, many of us are thrilled that sparkly white flakes will soon be falling on the mountains. As the autumn has been ushered in and ski and snowboard enthusiasts are on the hunt for new gear for the 2012/2013 season, Mount Washington Alpine Resort wants to finish the summer season with one last hurrah! 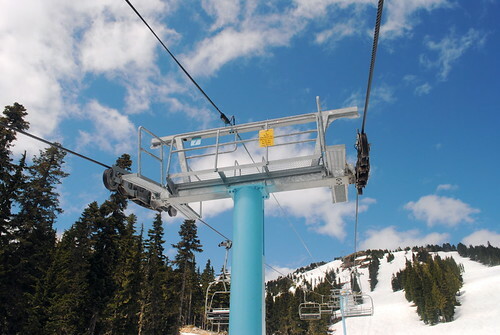 All afternoon on Saturday, October 6th, the mile-high chairlift rides will be whisking view-seekers to the top one last time before winter preparation begins. Simply bring either a non-perishable food items or cash donation for the local food bank and ride the chairlift for free! This weekend also marks the annual Turkey Sale, blowing out last season’s gear at prices that are downright goofy! Visit Altitude Sport and Gift and Mtn Tek between noon on Friday and 5:00 p.m. on Sunday to save 10-25% off brand new gear. For more information on these and other mountain events – and to stay in the loop about opening alpine dates – visit Mount Washington Alpine Resort online. You can also find the mountain on Facebook and Twitter.